A single save/load settings button for the plug-in. Each panel also has four quick memory banks to store and compare settings in realtime, as well as controls for saving and loading settings from disc for the panel or the entire plug-in. The very best way to eliminate background noise is not to record it in the first place. My friend Dan Brockett has an excellent article on recording clean location audio, but even the best are sometimes foiled by circumstances. The below file was recorded by Dan on a location which included loud refrigeration units close to the talent. If you play around with the original file you will find that the noise is in exactly the same frequency range as the talent, making it impossible to remove with standard equalization filters. Often this kind of noise can only be removed with the old fashioned "reshoot filter." With this much broadband noise the standard edition of SoundSoap produces a ringing quality to the voice ("flanging") and fluctuations in apparent volume as the signal to noise ratio changes ("pumping"). In SoundSoap standard the only real control you have to reduce these effects is to back off on noise reduction. With SoundSoap Pro you get a better result right off the bat, and then have a lot of manual control to further improve the results. For cases like this example, with a low signal-to-noise ratio and with noise that is similar to the signal, SoundSoap Pro produced a much better result. The most common and challenging noise reduction task I encounter is reduction of broadband noise. In SoundSoap Pro this task is controlled by one of the four thoughtfully designed control panels within the plugin interface (note the tabs at the bottom the above screen shot). The basic workflow is similar to the standard edition of SoundSoap, which you can read about here. Once you have "learned" the broadband noise, you can fine tune how much noise reduction is applied to individual frequency bands by unlocking and adjusting the sliders for both threshold and reduction. Additionally, you can adjust how aggressively the noise reduction will respond to changes in the signal by adjusting the attack and release controls. You can even skew, or "tilt" the attack and release timing so that it is, for example, more aggressive in the lower frequencies than the high. At the top of the interface is a kind of sonar screen which represents the audio processing as a visual balance between red and white. I found my ears to be the best guides, especially with a good set of headphones and monitors. The Click and Crackle filter can help with noise from poor microphone connections or from imported audio from vinyl records. The Noise Gate is a tool to further suppress noise during quiet portions of the track, when noise is most noticable. Anything more than a very light touch with this tool will be noticable as pumping, so be gentile! A really nice touch is that each panel is equipped with four quick memory buttons so you can save and compare settings in real-time. You can also save your settings to disc for individual panels as well as the entire plug-in. This is great when you have a number of files to process or if you will need to offline the project. When you have everything adjusted and the audio sounds good, you simply "bounce" the plug-in to apply the filter to your file. This is a limitation of Final Cut Pro HD rather than SoundSoap Pro. FCP HD does not support Audio Unit plug-ins with custom GUIs. Instead it supports only the types of controls pictured at right. 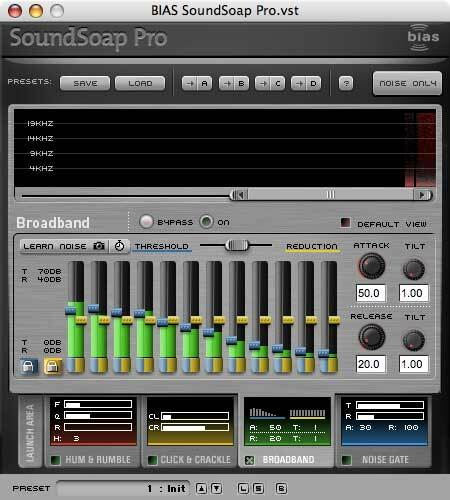 Other host programs (including Apple's own Logic and Garage Band) bring up the SoundSoap Pro GUI perfectly. I hope Apple will bring support for Audio Unit custom GUI interfaces soon as this interface is very difficult to use - it's basically unusable for training broadband noise. At the present the best workflow for SoundSoap Pro is to set Peak Express (or whatever host program you prefer) as the external editor for both Audio and Video files in Final Cut Pro. Then simply right-click the file you want to edit and select "Edit in external editor." This is a significant limitation, as it means that you cannot keyframe the noise reduction and must apply it to entire media files rather than clips. Various host programs such as Peak have their own ways of applying different settings to different sections, but none give you the simplicity of working directly within Final Cut Pro. An example of where this limitation becomes costly is if you need to offline a project. With the existing external-editor workflow you will end out having to redo the noise reduction manually, rather than simply having to re-render audio within FCP. SoundSoap Pro requires a USB Copy Protection Dongle for registration and usage. When you install SoundSoap Pro it will install a System Preference Panel to manage the USB Dongle. Registration, authorization, and the use of the dongle are complex enough to require an entire chapter within the SoundSoap Pro manual. The dongle is one more piece of hardware you need to manage, and uses a USB port which are in short supply on some Macs such as my Powerbook. If more software publishers were to pursue this method of copy protection (Apple now uses it for Logic Pro) it would quickly become unmanageable. It would be a nice touch if the dongle had a USB pass-through or functioned as a small hub rather than taking up a USB port. Bias' decision to go with a dongle is easy understand. I think this type of application is particularly vunerable to piracy from those who think, "I only need to use it for this one clip." Unfortunately we all end up paying a price in dollars and convenience for such thinking. The manual, while somewhat slim at 75 pages, provides a comprehensive overview of the GUI interface including discussion about each of the adjustable parameters. It does not cover the Final Cut Pro interface, which is best bypassed anyway. For those familiar with the use of the analog counterparts to these digital tools the manual will be sufficient. For video editors new to the principles of using audio filters, plan on spending some time in trial-and-error learning how to fine-tune the filters. A tutorial project and media included to get you started. Performance using SoundSoap Pro under Peak was tenuous on my 867Mhz Powerbook Titanium with 512MB of memory. On this machine the sound would occasionally pop and click or pause during playback. On my dual 1Ghz G4 with 1GB of ram everything worked perfectly, with adjustments working smoothly in realtime. SoundSoap Pro produces outstanding results even with files with very high levels of noise. It clearly uses more advanced algorithms than SoundSoap standard for broadband noise reduction and produces dramatically better results even with the default settings. The manual control over every aspect of noise reduction gives you a Swiss Army Knife approach to noise reduction, all within a simple and powerful interface. The poor Final Cut Pro interface and the copy protection dongle are significant drawbacks, but can be worked around. The most significant issue for many in considering SoundSoap Pro will be the $599 price tag, so let's explore that a bit. If your needs are for occasional, non-critical removal of low to moderate noise, you can probably get by with SoundSoap or with the tools included with FCP. My work (primarily business interviews) frequently includes shooting in noisy locations, and the results are shown in conference facilities where the PA systems seem to emphasize all the wrong things. Previous to Sound Soap Pro, "industrial strength" noise removal tools started at $1200 - more than Final Cut Pro! Compared to a reshoot or a lengthy ADR session (both typically impossible with my subjects), even that cost could be justified. So at half the price of the Waveform Restoration Bundle for the same features, SoundSoap Pro is a welcome addition to the noise reduction marketplace. For a total of $899 you can purchase the Peak Restoration Edition which includes the full version of Peak, SoundSoap Pro, and SuperFreq, a suite of multi-band paragraphic mastering equalizers. If you don't already own a good audio editing program, you might want to consider this as the full version of Peak provides a lot of power compared to Peak Express. You can see a chart of the differences here, but the most significant advantage to the full version is the ability to run multiple audio filters in a stack in real-time, then apply them with a single "bounce." If you need a professional quality noise reduction solution, SoundSoap Pro should be high on your evaluation list.